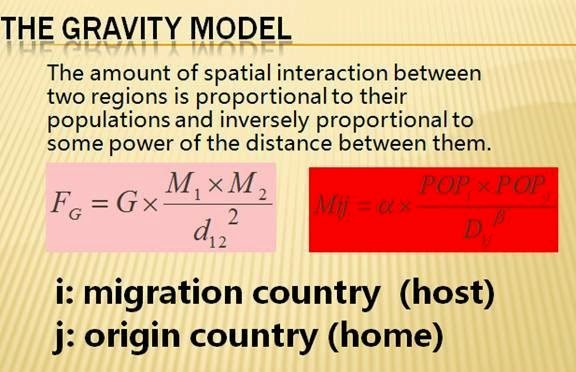 An old theory in international trade (and migration) but which I heard and read only last month, is the gravity model. This is on top of the classical David Ricardo theory of "comparative advantage" and the Heckscher-Ohlin theorem of factor abundance as basis for trade. The first two theories assumed that all other things being equal, meaning distance between and among trade partners are assumed to be similar. 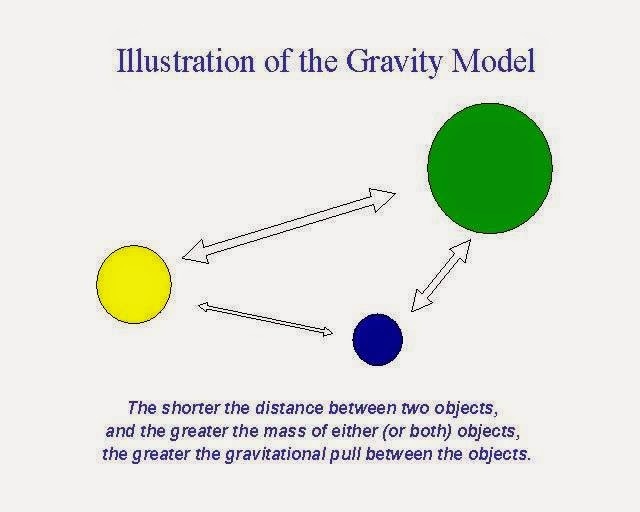 The addition of the gravity theory on the first two or other theories somehow completes the picture of why and where people in one country trade more with people in country X than in country Y. Below is an illustration of economic mass (GDP size, especially) and corresponding trade with each other of major economies, as well as the medium and smaller size economies. The US, EU and Japan are prominent in the illustration. * Note: these three illustrations I got from the web, I did not develop them. A simple and generalized illustration and definition of the theory. This can apply in international trade, migration, tourism, investments, cultural exchanges. Thus in international commerce, trade costs increase with distance between or among trade partners. Technology comes in to reduce such trade cost, via huge container ships, jumbo cargo planes, and so on. Another illustration and basic math formula. F is the trade flow, M is the economic mass (GDP size) of each country, d is the distance and G is a constant. There is direct relationship in M and inverse relationship in d.
So again, it is nature and geography that initially or generally dictates movement of goods and people, not so much governments. But governments with more market-friendly policies encourage faster growth in M, which later attracts or begs more trade with people from other countries. 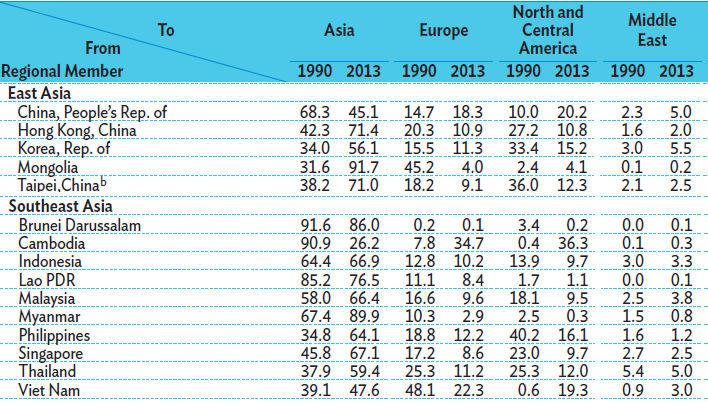 Below is an illustration of the shift in trade of selected Asian economies from 1990 to 2013. 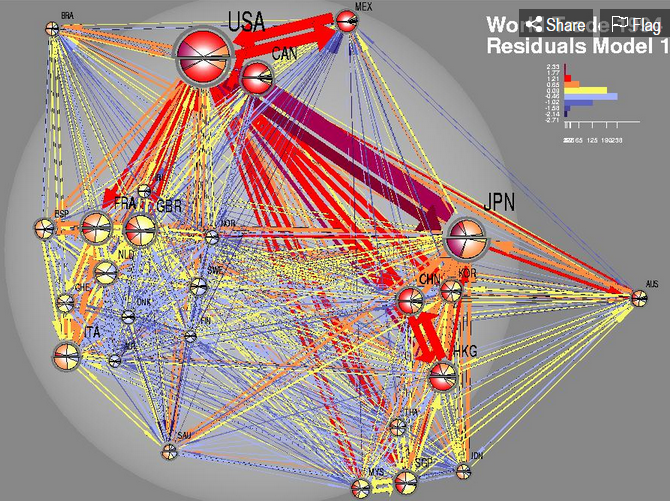 Before, a number of Asian economies tend to trade more with their former colonial masters (ex. Philippines trade with the US; Cambodia with France?) or political allies. This has slowly changed through the years, especially from the late 90s up to the present. Asians now trade more with each other, partly because of regional free trade areas (FTAs) like the ASEAN FTA (AFTA) that have been established and formalized. source: ADB, Key Indicators for Asia and the Pacific 2014. Earth Hour 6: The WWF can Change Climate Change? China Watch 20: Fortify PH Garrison?